Already June – that beautiful first month of summer – that beautiful month the Church dedicates to the Sacred Heart of Jesus. But this June is a landmark June – it is June, 2017, and 100 years since the visits of Our Blessed Mother to Fatima. The Message of Fatima is a call to penance, conversion, prayer. It is a call to loving obedience to God’s commandments, to faith, hope and charity. It is a warning, too, and an assurance that the souls of men may work with the Providence of God to accomplish His great designs of peace to the world. Proof of the protection of Heaven to those faithful to Our Lady’s message and warning may be seen in the wondrous story that follows. August 6, 1945 was a tragic day in human history. It was, of course, the day when the first atomic bomb was dropped on Hiroshima, Japan. It did contribute to end the war in the Pacific, which saved lives. But no one can deny the tragic loss of innocent life that day. The bomb instantly ended 140,000 human lives, flattening everything within a 1.2 mile radius and collapsing buildings up to nearly 10 miles away. And that was only the beginning of its destructive power, for it is estimated that as many as 200,000 more people lost their lives, succumbing to the intense radiation emitted by the bomb. In the foreground is a photo of the Church of Our Lady’s Assumption and up the road is the presbytery where the eight German Jesuit priests survived the bombing and lived to tell the miracle. Almost all are familiar with these facts. But very few know that there was a miracle at Hiroshima that day. Only eight blocks (just a little over half a mile) from the epicenter of the blast, a small Catholic two-story religious house remained completely intact, only suffering broken windows. Every other building in the area was completely obliterated. According to scientists, the blast should have killed in an instant anyone so close to the bomb. But the eight Jesuit priests living inside that house only suffered minor injuries, and even more astonishingly, over thirty years later were in perfect health with no signs of radiation sickness. While hundreds of experts and scientists say that this incident defies all human logic from the laws of physics, Father Shiffer (the Superior of the house) had a very simple explanation for God’s extraordinary protection on that day: “We believe that we survived because we were living the Message of Fatima. 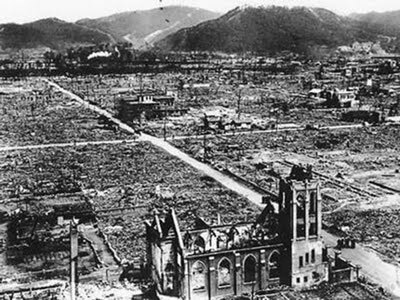 We lived and prayed the rosary daily in that home.” This same reason was given by the Franciscans in Nagasaki, who miraculously survived in good health the bombing of that city three days later, their house suffering only minor damage. To read and learn more about these astounding and moving signs of a Mother’s protection, we suggest this website and this website. Celebrating the anniversary of the Fatima apparitions, we must recall the state of the world at that time. In 1917, Europe was being torn apart by the First World War. Pope Benedict XV, a distinguished diplomat who had seen all his efforts for peace thwarted, turned to Our Lady and made a desperate plea and prayer for peace. It was the 9th day after that prayer was uttered that Our Lady first came to Fatima. She promised an end to the war, but warned that in order to avoid future war and catastrophe, mankind needed to practice penance, to pray the Rosary daily – in essence, to make a conversion of life,. Today, June 13th, is the anniversary of the second of six visits of Our Lady to the Cova da Iria, the pasture land near Fatima in Portugal. It was on this day that Our Lady first showed Her Immaculate Heart to the children. It cannot be a coincidence that Our Lady chose for this revelation the month of June, dedicated to devotion to the Sacred Heart. And there is a striking resemblance in her revelations that day to the messages given by the Sacred Heart to St. Margaret Mary over 300 years ago. Did not Our Lord also reveal His Heart as the source of grace and consolation? Did He not also plead for conversion, for reparation, for a return of love? His request to the king of France, that the country be consecrated to His Sacred Heart went unanswered. Many suggest that the French Revolution (which broke out on the centenary of that vision), and the tragedies which befell France and even the rest of the world, were a punishment for that failure. Our Lord’s requests went unanswered, and so He sent His Mother to Fatima in another attempt to win the hearts of His children. Devotion to the Sacred Heart and the Immaculate Heart is a united devotion. One are those hearts of Jesus and Mary, and our hearts must be united to theirs. 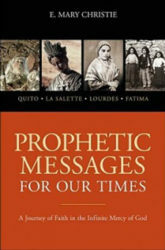 Those familiar with the messages of Fatima are also familiar with the many prophetic warnings Our Lady gave, along with the dire consequences should her requests not be heeded. Are we seeing in our troubled world and troubled times the fulfillment of those prophecies? Are we at another tipping point in history, just as the French Revolution was? What lies in store for our generation, which has stubbornly continued on its path away from God into a more atheistic society? As Christians, we all know the end to the story: the victory of Christ, His Truth, His Church. But we also know that we have a part to play. Let us, therefore, pray and sacrifice that the inevitable victory may come soon! “I will be your strength. Fear nothing, but be attentive to My voice that you may be in the requisite disposition for the accomplishment of My designs”. 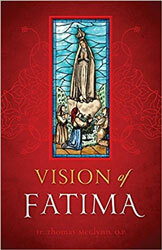 Two books that present Fatima’s history and message are new to our website, and we think they offer quite beautiful and penetrating insights into all that Our Lady came to tell us: Vision of Fatima and Prophetic Messages for Our Times. We were also pleased to find and make available a beautiful medal of Our Lady of Fatima whose reverse side is an exquisite Sacred Heart image – all to further the truth that the Sacred and Immaculate Hearts are so very joined. 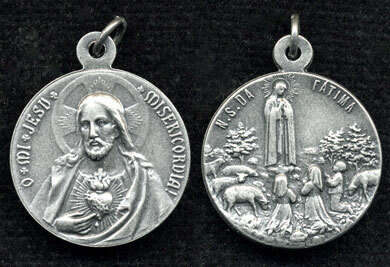 The two sizes include one quite small that is suitable for a rosary side medal. The use of sacred images to honor Our Lord, His Mother and the Saints is an almost entirely Catholic devotion. It is one that is widely misunderstood by non-Catholics. While it is not our purpose here to explain the history of Sacred images, from the etchings on the walls of the catacombs to the present day, we think it worthwhile to spend a moment explaining this ancient Catholic practice. Many people compare the use of Catholic images to the way we use all other pictures, as a reminder of a person or people we love, and this is certainly true. Is it so unusual for woman to set a picture of her husband on her dresser, or hang pictures of her children on the refrigerator, or carry photos of the family in her wallet or in a locket around her neck? What grandfather is there who doesn’t love to show off his grandkids, flashing photos to friends? It is not uncommon for people even to kiss photos of their loved ones, talking to them in times of great trial or separation? We certainly know that the printed paper in front of us is not that person, but it is a symbol, a connection in a way. Should it be that unusual that if we surround ourselves with images of our loved ones on earth, we should not do the same for our loved ones in Heaven? Who are these people, but close friends of God, whom He blessed abundantly and used to spread His Gospel and accomplish His will for good in countless ways? But religious images are far more than this, because they are not only visual reminders but Sacramentals as well. We remind you once again about the definition of a Sacramental: A symbol, an outward sign instituted by Christ through His Church to give grace. 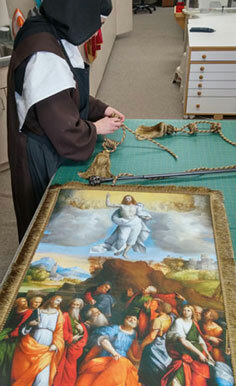 Once a religious image has been blessed, it has been “transferred into the realm of the Divine,” we might say. God uses images (pictures, crucifixes, statues, medals, etc.) to bestow graces, helps in our spiritual life, consolation and encouragement, when used with devotion. Throughout history, these graces have sometimes been given in astounding ways. How many times have we heard of crucifixes coming alive, in order to talk with and counsel the person praying before it. How many times have we heard of images of the Sorrowful mother weeping real tears, and moving all of those before it to appreciate the sorrows of the crucifixion more deeply? How many images have even become means of God granting miracles – curing the sick or saving whole towns from natural disasters or sickness when carried in procession? Perhaps less astounding but just as real, are the graces that we all receive every day from the images which we have around us – a glance at a sacred picture which becomes the occasion of a prayer that would have otherwise not been said, kissing a crucifix in an act of love of Our Savior, the consolation of “visiting” Our Blessed Mother by stopping to kneel in front of her image in the Church for a moment. We should not be afraid to use and venerate sacred images; they can be great helps to us. Realizing that we are not venerating the image in itself, but rather what and who it represents, it becomes a special connection, an outward sign for the spiritual life, a connection with the triumphant part of the Mystical Body of the Christ which we cannot see or hear. Realizing that the purpose of images is to increase devotion, we should be sure that the images we use do just that. Some images are not devotional, but are merely “artistic” or somewhat bizarre. Our Lord, the Blessed Mother and the Saints should be pictured reverently. We have carried sacred art prints and statues on our site for some time, but were delighted to be able recently to add more high-quality framed prints to our website. These pictures (indicated by a * in front of the name) are printed on special paper that does not require reflective glass to protect them. We highly recommend these prints and plan to add more as they become available. May 13th was the occasion of celebrations all over the world, and we certainly did not let the day pass here in Carmel without paying special honor to Our Lady. In the evening we held a small procession, stopping at several stations to say the rosary, recite a Litany of invocations to Our Lady composed by the Sisters, and lastly, a Prayer of Consecration of the Community. Two of our Sisters were privileged to visit Fatima before entering Carmel, and they described for us what it was like to be part of the processions there. It was a beautiful and very peaceful evening! The return of milder weather has brought the return of all sorts of wild critters to the enclosure. And Zelie is on duty to terrorize them. She has a hard time patrolling the grounds, heaven forbid any birds should land on the roof! After some weeks, though, she’s become somewhat accustomed to the robins and other songbirds, and will leave them alone when we tell her to. Thank goodness for that, since we have birds nesting all around the place: robins in the nearby junipers, crows atop the high ponderosas, Mountain bluebirds in one of the nest boxes, and chickadees still building and deciding in another. But in early spring, we had a rather large and unexpected visitor in the form of a giant turkey, who spent a whole night hiding in a tree after Zelie chased it around the grounds. She continues to be a joy to the Sisters, dogging our footsteps as we go about our day to day activities. Having heard about the severe colds people have been hit with this spring, when two of the Sisters became sick, we all held our breath…literally. But it is difficult to escape once a bug enters the cloister. 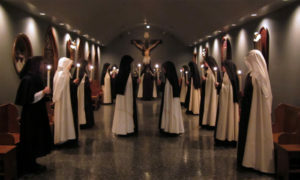 As one Sister said, witnessing the Sisters succumb, one by one, “May the best immune system win!” Our Lord had mercy in that there were always a couple of Sisters with voice enough to keep the chant going in the Divine Office, though we are sure it sounded a little raspy at times. But if the frogs can sing God’s praises so could we! Only three Sisters did escape the bug – and to the credit of the strong, two are half Irish, and one Polish! Everyone is on the mend now, and we are relieved. It’s always a bit of a “production” to have so many people sick at once… What can we say, except that for the duration, being sick was our daily duty?! Sometimes we are at a loss of what “news” to tell you in this part of our newsletter. Our hours spent outside the Choir do not vary much from day to day. We clean, we cook, we sew, we garden, we make rosaries and other sacramentals. Although we are never bored, we suspect many people would find our daily life a bit dull…Life in this “veil of tears” is just that way, sometimes. For most people, there are the daily, ordinary duties of life that can be tedious and just plain uninteresting. But this brings us right back to the Message of Fatima. And we must say that we believe this to be one of the most consoling parts of the Message and its guiding element. It is that of the importance and value of daily duty. The Angel who in 1916 made 3 preparatory visits to the children, instructed them: “Offer up everything in your power as a sacrifice to the Lord in reparation for the sins by which He is offended, and in supplication for the conversion of sinners . . . More than all else, accept and bear with resignation the sufferings that God may send you.” What are “the sufferings that God sends,” except the bumps in the road of everyday life, the effort involved in just the faithful accomplishment of the constant and sometimes boring and dreary duties expected of each one of us in our vocations? 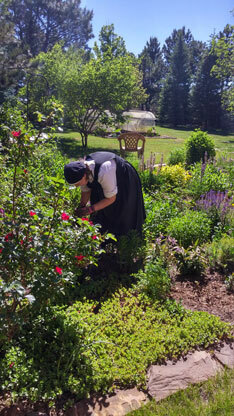 Postulant working in the garden. Many people get sidetracked by the extraordinary things they would rather be doing and leave behind the primary essential duties of their vocation in life. How difficult it can be to be faithful to those small seemingly unimportant obligations, which can secretly become rich treasures – so many special sacrifices offered to the Sacred and Immaculate Hearts, if only we grasp onto them and do them for love of God! How can we expect that we will be faithful to greater callings, enormous apostolates, even martyrdom itself, if we are unable to be trustworthy in the small things, the small graces, the small requirements of Catholic life? It is here we must start, and it is here that we will find our strength for whatever else God chooses to send our way. It is these small crucifixions of daily life, which will prepare us for the greater cross of our life, whatever that may be, and make us worthy of the glorious victory to come. Tomorrow afternoon, in preparation for the Feast of Corpus Christi on Thursday, June 15, we will be privileged to have Exposition of the Blessed Sacrament. Please know of our remembrance of all the Friends of Carmel before our Savior in His Sacrament of Love!